Michael Ambrose is a life member of Houston Safari Club since 2008 and a lifelong bird hunting enthusiast. He began Big Game Hunting in 2006 at the age of 60. A veteran, ex-Navy Seal and commercial diver for 23 years working around the world in the Oil and Gas Industry. He moved into management in 1991, specializing in Sub Sea services both domestic and foreign. He has worked for a variety of marine construction companies in the offshore construction sector. Retiring in 2010 from Cal Dive International of Houston after more than 20 years and as International Business Development Executive Vice President. He accepted the General Manager Position for Mermaid Sub Sea Services based in Chonburi Thailand in 2012 and ran the company for 3 years until March of 2015 when, after achieving the recovery and growth he was brought into achieve he retired once again. Michael has been married to Suzanne Ritchson Ambrose since 1994, a career Oil and Gas Financial Accountant who served the last 5 years of her active business career as the CFO of a Gulf of Mexico Based Oil and Gas Production Company. They live in Sugar Land Texas and are avid golfers, enjoy hunting ducks, geese, and dove and spending some time fishing for Red Fish and Speckled Trout in the waters near the Texas and Louisiana Coast. He is also a late blooming avid Big Game hunter and has achieved his Africa Diamond Award as well as 5 others and several SCI Grand Slams and Continental Awards and received “HSC Outstanding Hunter of the Year Award” in 2017. He has served on the HSC Silent Auction Committee for four of the past five years and was Chairman for the 2017 Convention “Into the Wild”. He has donated resources as well as time and energy to promoting conservation of our wild places both domestic and foreign. He has been a financial sponsor to several conservation and anti-poaching programs. 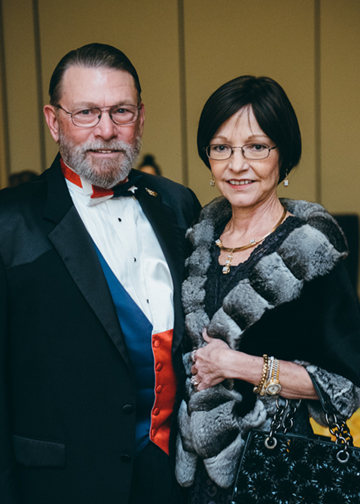 He has time and energy to devote to the goals of Houston Safari Club.